Streep has had 16 nominations, but has only received two statues (Kramer Vs. Kramer and Sophie's Choice). Now I ask you, how can it be that she has NOT won since 1982? Will this be Sandra's year, similar to Julia Robert's in Erin Brockovich? The academy awards are a week away and I am torn. I adore Sandra Bullock and would love to see her win, but I also think Mrs. Streep is the most talented actress ever. I normally have a favorite, but this year I will feel bad for whichever actress does not win. I love you Sandra, you will forever be my favorite actress, but did you out act Meryl? I have seen Julie and Julia, but not The Blind Side, so I would love to hear from people who have seen both films. I have heard from several people (whom I respect) that Sandra was good, but the story itself made the movie great. 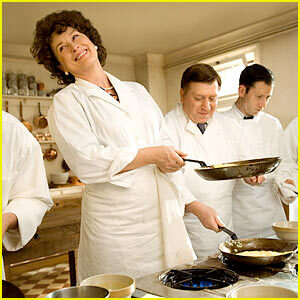 Having seen Julie and Julia I have to say that Meryl made the movie. My next question is (to those of you that have seen both) could another actress have pulled off Sandra's role without messing up the message of the film? If the answer is yes, then I think Meryl deserves the statue, because I cannot think of any other actress that could have pulled off playing Julia Child. I love Sandra and I will be happy either way, but who do you think truly earned the statue, or will it be stolen away from both of them in an upset? I need to watch Julia and Julia and you need to see The Blind Side so, we can discuss. I thought Sandra was amazing and nailed the character perfectly. I haven't seen Meryl in Julia and Julia but, I love her in every movie. It is a tough call. I am going to try and see The Blind Side this weekend (if it is still around). Mom is having a Oscar's party, so I need to be prepared!